Communication is more than just talking and listening – it’s also about sending and receiving messages through attitude, tone of voice, facial expressions and body language. As people with Alzheimer’s disease and other dementias progress in their journey and the ability to use words is lost, families need new ways to connect. 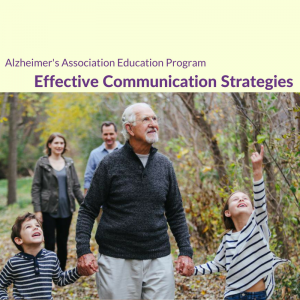 Join us for this FREE program to explore how communication takes place when someone has Alzheimer’s, learn to decode the verbal and behavioral messages delivered by someone with dementia, and identify strategies to help you connect and communicate at each stage of the disease. • Identify the communication changes that happen due to Alzheimer’s disease. • Learn how to decode verbal and behavioral messages delivered by someone with dementia. • Identify strategies to help you connect and communicate at each stage of the disease. Pamela Beidler MSHCA, is the Director of Programs and Outreach at the Vermont Chapter of the Alzheimer’s Association. She is a Certified Dementia Practitioner with a passion for working with our community’s most vulnerable populations and finding ways to empower individuals through health education. Space is limited – Reservations are suggested. Visitors are invited to tour the expanded North Village, with 20 Independent and Assisted Living Apartments and a State-of-the-Art 20-bed Memory Care Center. Cedar Hill staff will be available to provide additional information. The Village at Cedar Hill Speaker Series will continue in 2017, with presentations on topics of interest to the senior community in the coming months. Cedar Hill was founded in 1988 by Mary Louise Sayles, a registered nurse and licensed nursing home administrator with many years of experience in long term care administration. Mary Louise’s daughter Patricia Horn, who is also a licensed nursing home administrator, is Chief Executive Officer for Cedar Hill Continuing Care Community.